Google Earth and Google Maps can superimpose images on the charts. The problem is that they recalculate the coordinates of the document - an image - based on an Anaximandre (square) projection. The NOAA faxes are available as Mercator projection; so I had this interesting Java exercise to turn an image representing a Mercator projection into an image representing the same data, but using an Anaximandre one. Interesting, indeed. The same operation is probably available for the other projections, we'll see that later. The Google Earth one is pretty interesting, as you can use it in conjunction with other overlays, like clouds, winds, etc, from different origins. It's quite snappy. 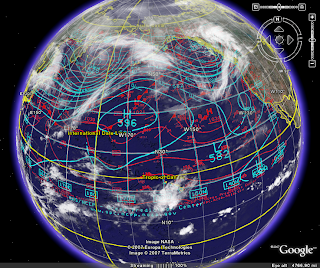 If you have Google Earth installed on your computer, download this kmz file, and try for yourself, it's for the North Pacific. And if you don't have it, you should get it, it's free. The cloud layer in the picture above can be reached through http://www.barnabu.co.uk/live-global-clouds-for-google-earth. A first version of the software, allowing to superimpose a GRIB file on top of a satellite picture is now available. Calculating the projection was quite a challenge, but it seems to work. It really relates the wind and the clouds. 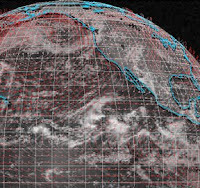 GOES-12 (Geostationary Operational Environmental Satellites, West) provides very suitable pictures for this kind of exercise. The ITCZ (Inter Tropical Convergence Zone) becomes really obvious, very interesting to see that. 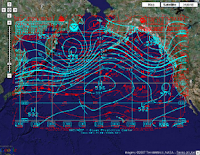 The same kind of superimposition can be done with the faxes received from SailMail, I will very soon give it a try. The image on the right can be clicked, to see more details.